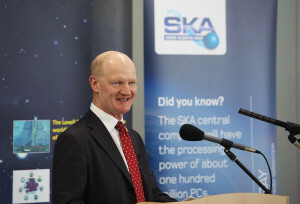 11 March 2014, SKA Headquarters, Jodrell Bank Observatory, UK – The UK Science Minister, the Rt Hon David Willetts announced funding of £100M (€120M) for the Square Kilometre Array (SKA) project, speaking ahead of an event at Jodrell Bank Observatory today. The emblematic observatory hosts the headquarters of the SKA Organisation, which leads the project. STFC also confirmed that it is investing £19M over the next four years in the SKA project. This represents a major investment in the SKA, whose first phase (Phase 1) of construction has been cost-capped at €650M. Under the current schedule for the project, funding for construction of Phase 1 is due to be confirmed by 2016 with start of construction expected in 2018 and early science expected to start in 2020. Effectively, Minister Willetts’ announcement secures a significant portion of the construction budget for Phase 1, bringing the project that much closer to taking off. Following the announcement Prof. Phil Diamond, Director General of the SKA Organisation, said: “This is a really exciting announcement for the SKA and a solid proof that the project is now really underway. With such a major investment secured there is no stopping it”. The SKA project is an international effort to build the world’s largest radio telescope. In a huge leap forward in both engineering and research & development, the SKA will use hundreds of dishes and hundreds of thousands of antennas connected together by optical fibre, and co-located in Africa and in Australia. Thanks to its sheer scale, the SKA will tackle transformational science questions, ranging from black holes, galaxy evolution, dark energy, cosmic magnetism, even gravity and life in the Universe itself. 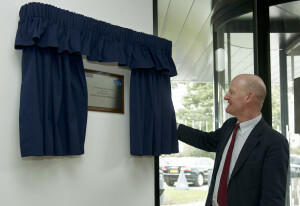 The SKA project has been moving forward at a steady pace with the establishment of the SKA Organisation as the supervising body to oversee the project in 2011, the dual site selection in 2012 and the start of the final design phase of the project in November 2013, with the selection of 11 teams -so called consortia- each designing a specific element of the telescope. This represents over 350 scientists from 100 organisations from the public, private and industrial sectors in some 20 countries around the globe, working on designing this revolutionary machine. Prof. John Womersley, CEO of the UK’s Science and Technology Facilities Council (STFC) and chair of the SKA Board, said: “It’s fantastic news for the SKA. This represents a significant investment on behalf of the UK and, along with our other contributions, aims to confirm the UK’s leading role in key aspects of the project”. STFC also confirmed that it is investing £19M over the next four years in the SKA project, made up of a capital investment in Big Data of £11M and a further £2M a year in the on-going core programme. The UK is already heavily involved in the effort to design the computing and software for the project which will have a data processing capacity 1,000 times greater than currently available. The £19M from STFC will be made up of grants to the three main SKA technical institutes in the UK, the Universities of Cambridge, Manchester and Oxford, along with the University College London and the University of Southampton. The announcement comes as the SKA’s Board meeting is taking place at the SKA Headquarters, with high-level representatives from all 11 member countries attending. In another confirmation of the SKA’s convincing development, more member states are also expected to join the SKA Organisation in 2014. Photographs, interviews with key SKA staff and comments from today’s event will be made available by 4pm London time. The SKA project is an international effort to build the world’s largest radio telescope, with a square kilometre (one million square metres) of collecting area. The scale of the SKA represents a huge leap forward in both engineering and research & development towards building and delivering a radio telescope, and will deliver a correspondingly transformational increase in science capability when operational. Deploying thousands of radio telescopes, in three unique configurations, which will enable astronomers to monitor the sky in unprecedented detail and survey the entire sky thousands of times faster than any system currently in existence. The SKA telescope will be co-located in Africa and in Australia. It will have an unprecedented scope in observations, exceeding the image resolution quality of the Hubble Space Telescope by a factor of 50 times, whilst also having the ability to image huge areas of sky in parallel. With a range of other large telescopes in the optical and infrared being built and launched into space over the coming decades, the SKA will perfectly augment, compliment and lead the way in scientific discovery. 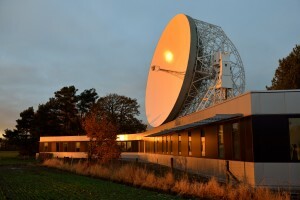 The SKA Organisation, with its headquarters at Jodrell Bank Observatory, near Manchester, UK, was established in December 2011 as a not-for-profit company in order to formalise relationships between the international partners and to centralise the leadership of the project. Eleven countries are currently members of the SKA Organisation – Australia, Canada, China, Germany, India (associate member), Italy, New Zealand, South Africa, Sweden, the Netherlands and the United Kingdom.